Scores 22 Highway MPG and 15 City MPG! This GMC Acadia delivers a Gas V6 3.6L/217 engine powering this Automatic transmission. WINDOWS, POWER WITH DRIVER EXPRESS-UP AND -DOWN AND PASSENGER EXPRESS-DOWN, WHEELS, 4 - 19" X 7.5" (48.3 CM X 19.1 CM) ALUMINUM (STD), TRANSMISSION, 6-SPEED AUTOMATIC (STD). *This GMC Acadia Comes Equipped with These Options *OPEN ROAD PACKAGE includes (UI8) Color Touch Navigation radio with IntelliLink, (C3U) Dual SkyScape sunroof, (UVF) Forward Collision Alert and Lane Departure Warning, and (V92) Trailering equipment , TRAILERING EQUIPMENT includes (V08) heavy-duty cooling and (VR2) trailer hitch, TRAILER HITCH, FACTORY INSTALLED, TIRES, P255/60R19 H-RATED, BLACKWALL (STD), SUNROOF, DUAL SKYSCAPE 2-PANEL POWER WITH TILT-SLIDING FRONT AND FIXED REAR with sunscreen, SLT-1 PREFERRED EQUIPMENT GROUP Includes Standard Equipment, SIDE BLIND ZONE ALERT AND REAR CROSS TRAFFIC ALERT, SEATING, 7-PASSENGER (2-2-3 SEATING CONFIGURATION) (Includes 2nd row flat-folding Captains Chair. May be substituted with (ABC) 8-passenger (2-3-3 seating configuration).) (STD), SEAT, 8-WAY POWER DRIVER with power recline and lumbar control and memory, SEAT ADJUSTER, 2-POSITION MEMORY FOR DRIVER'S SEAT AND OUTSIDE REARVIEW MIRRORS. 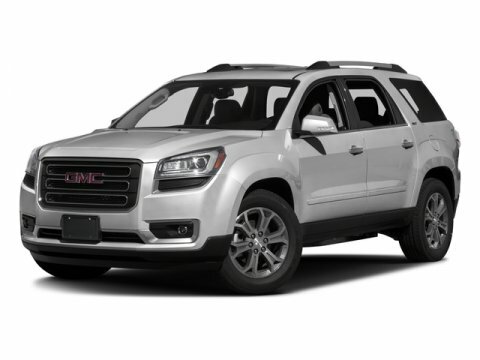 * Visit Us Today *Come in for a quick visit at Bleecker Buick GMC, 926 E 4Th Ave, Red Springs, NC 28377 to claim your GMC Acadia!